Blockchain is best known as the backbone technology for the digital currency bitcoin; it is an encrypted, digital ledger of public records organized into groups of data called blocks and distributed over networks. Blockchain is a type of decentralized database that allows everyone in a “chain” to see and verify the details of every record. More than 40 top financial institutions and a growing number of companies across industries are already using blockchain, according to The Wall Street Journal, and companies like Microsoft and IBM have made huge investments in the technology. Organizations are using blockchain for financial transactions, for supply chain management and to create “smart” legal contracts. How Wil It be Used in Talent Management? Blockchain is a way to store personal information about candidates or employees in a secure, confidential manner and make it available to anyone with permission from those individuals,. It could automate and speed the process of verifying job candidates’ credentials, saving recruiters from having to contact multiple sources to confirm historical information. It could reduce resume fraud and could improve time-to-hire. Blockchain also could one day transform global payroll by cutting out the banks—the “middle men”—that add time and costs to the process. The data in a blockchain cannot be deleted or changed, only added to and it is required that everyone connected to each block must agree before new information can be added into a chain. Job candidates or companies are assigned a digital ID and can add specific types of data to the chain, such as college grades or degrees. Blockchain may also have value when applied to the gig economy, where verifying the skills, knowledge and past assignments of contingent workers can be challenging. We could one day see that expand to the full contingent workforce. ​The Massachusetts Institute of Technology (MIT) is piloting a diploma system that can be accessed by such a digital key. The system allows MIT students to access and “own” a secure and certifiable digital file of their MIT diploma; the digital diploma is provided in addition to a standard physical diploma. Some start-up blockchain companies also have begun operating in the recruiting space. Last year Recruit Technologies and Ascribe announced a partnership to develop a prototype blockchain resume authentication service for job hunters. The service would enable the digital verification of official certificates and resumes, previously done on paper. The two partner companies claim the effort of collecting multiple official certificates would be reduced for job hunters, and recruiters could handle confidential official certificates safely and without worry of fraud. How Will It Keep Your Genomic Information Safe? An individual’s genetic material is perhaps the most unique part of his/her identity, detailing visible traits like hair and eye color, personality variations or susceptibility to diseases. While all this information is incredibly personal, blockchain technology has the potential to keep it safe. The ability to store this data means genomic information is no longer reserved for people in white lab coats: It can potentially be accessed by anyone with an internet connection. While all this information is incredibly personal, blockchain technology has the potential to keep it safe. 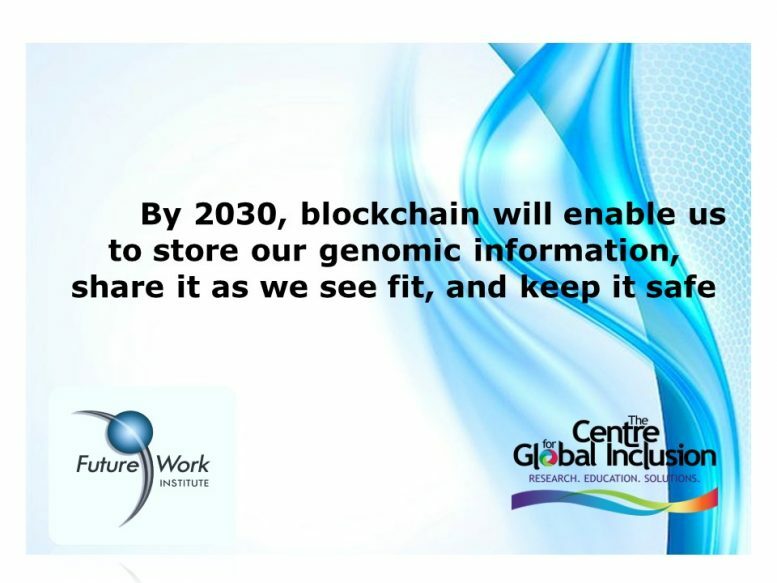 Storing your genome in a blockchain could give you the power to share it as you see fit, instead of letting Google, Facebook and other platforms host it. It would also allow medical researchers access to an anonymous web of billions of genetic sequences, letting them use pattern-matching processes to determine which genes make individuals susceptible to certain diseases and which genes create a natural resistance. Whatever your view, digitization of genetic information will inevitably become a reality, and the availability of large-scale genetic information has the capacity to change how the health industry works in numerous ways. From the ego-centric standpoint, individuals can get more personalized treatment for everything from allergies to diseases, whereas health care providers can infer how a person will react to certain treatments or medications by examining how people with similar genetic makeups responded. Now is a good time for us to become familiar with blockchain. We should be thinking about how processes could change in our worlds with the existence of a secure, validated digital identity ‘owned’ by candidates or employees, not by third parties. To understand more about blockchain, here is a link to a recent McKinsey podcast: Blockchain Explained: What It is and Why It Matters. For those who prefer a visual approach, open the attached Blockchain Infographic created by IBM.